Winter in the Midwest can be long. So when warm weather finally arrives we like to spend as much time outdoors as we can. For my family that means a lot of camping. But the girls are getting older and their activities, interests, and desire to spend time with friends, keeps us home as often as we are away. To combat the desire to be gone we’ve been creating an outdoor haven in our backyard that gives us the feeling of camping without the need to leave. Every year we add a few fun new finds to our camping gear. This year, at the invitation of Theisens, an Iowa based Home, Farm & Auto store, we found a few new items that work at home and away. Whether at home or away you want to be comfortable outside. Summer days need a hammock! A Hammock I don’t know if there is any one thing that symbolizes summer more than a hammock! 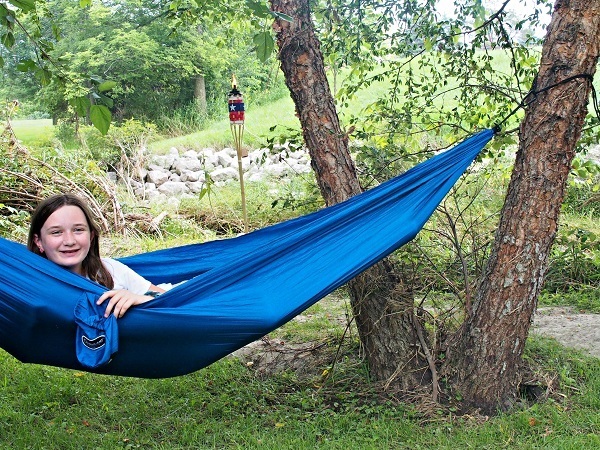 We love the Coghlan’s Parachute Hammock for its versatility and durability. When camping we will link this between trees or even from the back of our RV to the nearest sturdy spot. At home we link from our deck to a nearby tree. It’s the perfect spot to relax at the end of the day! Upgrade at home: We also have a couple of hammock chairs hanging from our deck. Perfect for outdoor gatherings! A Camping Chair Everyone needs a couple camping chairs! Use them for camping, tailgating, and sporting events. These go-anywhere chairs are the easiest way to add outdoor seating at home. A Protective Canopy We are never without a pop up canopy. While we have a few styles and sizes our favorite is a Pop Up Canopy with Screen Sides. You can never have too much protection from sun and bugs! 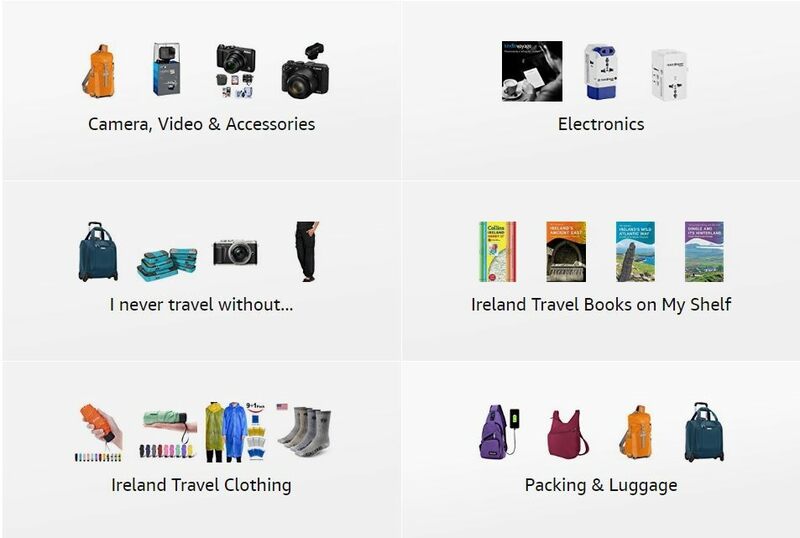 Why duplicate your cooking gear? Use your camping gear for backyard barbecues! A Portable Grill Our Coleman Collapsible Grill has covered many miles with us. Its enclosed design and interchangeable cook-tops make it a perfect patio grill, as well. Upgrade at home: A fire pit may not be terribly portable but having a sturdy round bowl fire pit adds to your outdoor dining options. Use it for Dutch Oven cooking or just toasting smores. 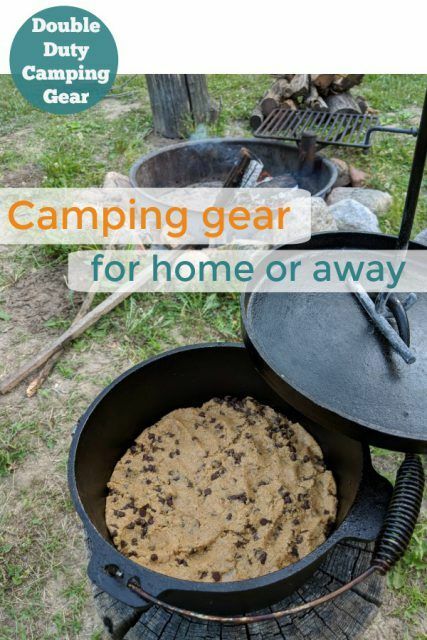 Bake a Dutch Oven Chocolate Chip Cookie in the fire pit! Grilling Utensils Why have a set of grilling tools for home and away? We keep ours in a handy bag and move them as needed. A favorite grilling tool is the Supertong. The dual tong/ spatula combo makes flipping burgers, vegetables, and foil packets easy. Cast Iron Dutch Oven Most of my camping recipes involve a Dutch Oven. So many that I actually have three sizes! I’ve made everything from breakfast scones and chocolate chip cookies to meatloaf and nachos. It’s the most versatile cooking tool I own and I use it often at home. Dutch oven tip: Be sure to purchase a Dutch Oven with legs as most recipes require coals both under and on top of the oven. A Cooler Keeping your food cold is a must when camping, but your camping cooler comes in really handy in the back yard for keeping drinks cold and trips to the refrigerator to a minimum. I recommend a wheeled cooler with cup holders. Place it right by your chair to use as a side table. We picked up these two items during our Theisen’s excursion. Though neither is essential camping gear, both are just fun to have. Tiki Torches Add a little light the fun way! We love these as an ‘outer edge’ to our campsite and at home at the edge of the patio. 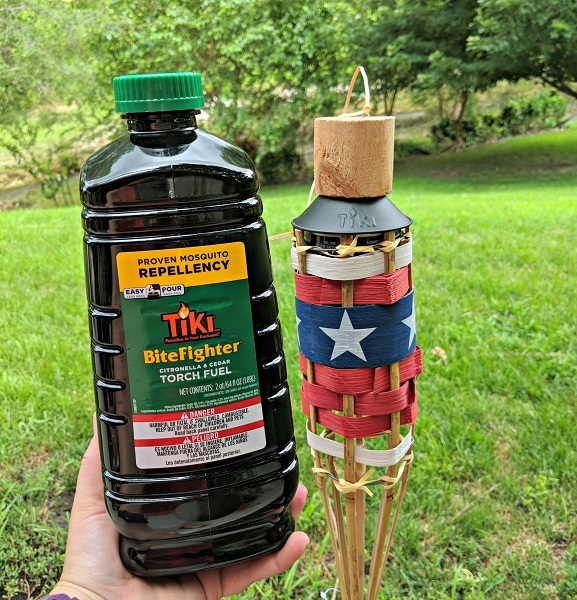 Tip: purchase Tiki Torch fuel with citronella to help keep bugs away! Firebuggz Fire Fishing Pole Why toast marshmallows and hot dogs on a regular camp fork when you can use a ‘fire fishing pole’ and flip your food with a flick of the wrist? What other camping gear works great in the backyard? Check out #SummerWithTheisens for more great ideas or visit Theisen’s online. 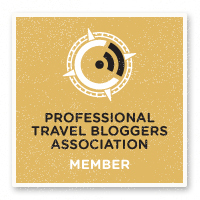 This post was published in partnership with Theisen’s. All items pictured are owned by me and all opinions are my own. We started with our hammock for camping adventures and we just bought a stand to use it in the backyard (since we don’t have the right trees). Definitely recommend the double use for it!